Janet Kurnatowski is pleased to present 'Soundings', new works by Elizabeth Hazan and Jennifer Riley from September 9 - October 9, 2011. There will be an opening reception for the artists on Friday, September 9th from 7-9pm. Sounding refers to exploring an environment by probing the surroundings and sending out a stimulus, much like a spider would cast a web and feel the vibrations on it’s lines…these two women are exploring their environment through color, line and form. Riley’s geometric abstractions have curvilinear forms that smoothly glide across pale surfaces. Her double lines arch, loop and dance in space as they try to contain her gestures within a vibrant spectrum of color. In “Spring Rain 2011”, bright yellow lines enclose rich ochres and softer shades of yellow, the lines split and morph into racy reds, electric blues and emerald greens as they continue to twist and loop like a roller coaster, enclosing lighter shades of themselves and creating a world within. 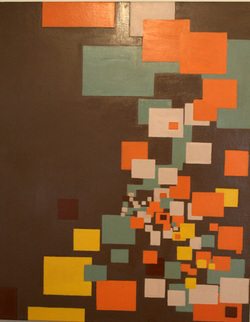 Hazan’s geometric vocabulary is a contrast to Riley’s, her canvases are saturated with angular shapes and colors that stretch from edge to edge. Hazan’s forms are created through combined repetitive rectangles that are disloged and transformed by a fusion of solid colored triangles, diamonds and ovals that shift and overlap, creating various landscapes. Hazan and Riley are connected in their vibrant palettes. In Hazan’s “Untitled (Blue in Green)” a lovely teal is fragmented across the canvas and envelopes patches of a soft blue. Darkness turns to light when black fragments are pushed back by flesh-tone beige, teal, and molten orange. Her shapes come together like pieces of a jigsaw puzzle, revealing aerial landmasses in the process. Jennifer Riley lives and works in DUMBO, Brooklyn. She has shown nationally and exhibited at Allegra La Viola, Lennon Weinberg, Jason McCoy, Spanierman, Lohin Geduld, John Davis and Heskin Contemporary. Elizabeth Hazan lives in NY and works in DUMBO, Brooklyn. She has shown nationally and has exhibited at Paterson Museum, Tibor de Nagy Gallery, Mulligan-Shanoski in San Francisco, New York Studio School and Hofstra Museum. For more information or images please contact Janet Kurnatowski.